How long have you been surfing the web? And no, I don’t mean today, I mean for how many years? At what time frame did the internet become so popular? Some people say when E-Mail was started. Others when Google appeared. Most of you would probably say anywhere between the mid and late 90’s. I really didn’t start surfing until the new millennium. I’m only 18, but that’s beside the point. What would you say if I were to tell you the Internet has been around since 1982? Pretty weird don’t you think? It doesn’t seem like we have been online that long. And truth is, we haven’t. It pretty much wasn’t until the 90’s that the Internet became a daily thing for a lot of people. I’m sure there are plenty online today that only check their email. But the real question is, “What has the Internet done for us?”. I believe the Internet has evolved a community to operate on a vast amount of networks. 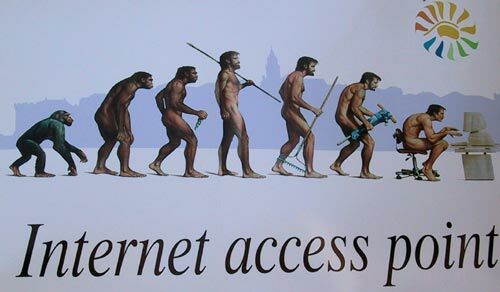 Eventually we will all be connected to the internet by some form or another. The world is updating itself too quickly to go back now. Does anyone see that as a problem? I’m not really sure how I feel about it. I do enjoy being able to connect with my friends several hours away in a matter of seconds. It can take someone longer to pull out their phone and call a person than it takes to connect to them. With social networks like Facebook and Twitter, there are limitless opportunities for someone to get in touch with another. I know many adults that have found high school and college friends through Facebook that wouldn’t have any other way, besides hiring a private detective! But with more information we put online, it opens another kind of door. And that door is fraud. It’s not very hard for someone to steal your identity and I have to caution you about putting up delicate information. Put it this way, if I wouldn’t tell something to a complete stranger, I try not to put it online! I realize that I went on a rant but I felt like it was important. So, in your opinion, what has evolved a network community? Maybe it’s not Facebook, Myspace, Twitter, etc. Perhaps It’s how you express yourself as an individual in a virtual universe! « The Internet Making Us Dumb?